Garbarino succeeds almost beyond measure in being a voice for killers. They get a hearing. It is not always easy to listen to – but the humanity is there in a way that needs to be heard. No one is saying that some of these individuals should get out of prison – many are so damaged that it would make no sense and be a risk. However, in other instances, the conversation may be necessary. Our thanks to Jim for the contribution and for the journey, still underway. Empathy is no rumor in the work Jim Garbarino is doing – and we acknowledge his. Join me for an “on the air” interview with Jim on the VoiceAmerica Empowerment Internet Radio network [click to listen]: A Rumor of Empathy in Listening to Killers – with replay available shortly after April 22nd. James Garbarino presents lessons learned from his twenty plus years as a psychological expert witness in murder cases. Understanding the victims of violent crimes and the survivors is relatively easy for any decent human being. It is easy to include the survivors in the circle of caring of the community. However, what about understanding the killer? 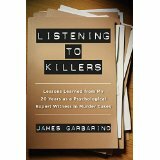 Listening to Killers by James Garbarino: Lessons Learned in 20 Years as an Expert Witness in Murder Cases about understanding the killer?